Dress up your engine with a set of our black anodized valve covers - custom engraved with your logo or slogan. Talk about impressive - these covers will get you some attention! Not only do they look great - but your logo will really "pop" against the black background. Our fabricated valve covers are made with 1/2" billet rails and are welded - inside and out - to either .090 or .125 sheet metal - all made here in the USA. The only way they could look any better is to have them black anodized and engraved with your logo. Quantity discounts on orders of 5 or more sets. Our Professional Series billet-rail valve covers put Billet Fabrication on the map! On the Professional Series you get extra-thick (.090″) sheet metal, solid-billet attachment tubes, and the nicest heliarc welding in the industry — all for the price of stamped-out valve covers! The constant removal and installation of valve covers required in professional racing teams led to the development of our billet-rail Professional Series. If your engine experiences high vacuum levels and/or requires regular valve adjustments, you need the incomparable sealing and fit assured by CNC-machined billet rails. These 1/2″ thick rails are heliarc welded to hand-formed, 3003 sheet metal, and precisely machined to match your gaskets. Even after years of use and hundreds of removals, the strength and flatness of billet rails assures the integrity of the sealing surface. Additionally, we offer either pass-through-tube or “tubeless” mounting for many engine applications. All Pro-Series valve covers are sized to accommodate the largest cylinder heads, rocker assemblies and stud girdles in use today. These should be the last valve covers you ever have to buy for your engine! 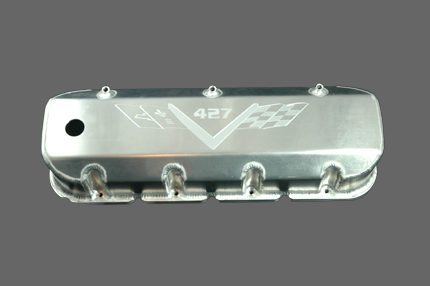 The quality of our Professional and Sportsman Series valve covers is second to none. We also offer erectiewinkel options such as valve spring oilers, breathers, fittings, and affordable custom engraving. Because engraving is accomplished entirely in-house, the cost is now within reach of every company or racing team. Call us today! Extra-thick .090″ sheet metal walls.